Wiring is the subject of the day; specifically, the benefits of a well-planned outlet system. Confession: our lovely model below at first looked to us a bit more bird-like than was probably intended. It's more likely she is simply thrilled at her splendid new floor outlet than she is growing a beak in manner of Kafka... right? "Acquiring adequate wiring is the first step to decorating with light. Figure out all the appliances you want serviced, and all the light fixtures and lamps you will need. Then call in professional help to do the actual wiring job. Conveniently placed outlets are next in importance. Temporary remedies are devices approved by Underwriters' Laboratories for carrying a cord along a baseboard. Metal strips with outlets at 1-foot intervals can be placed along baseboards or tops of work counters. 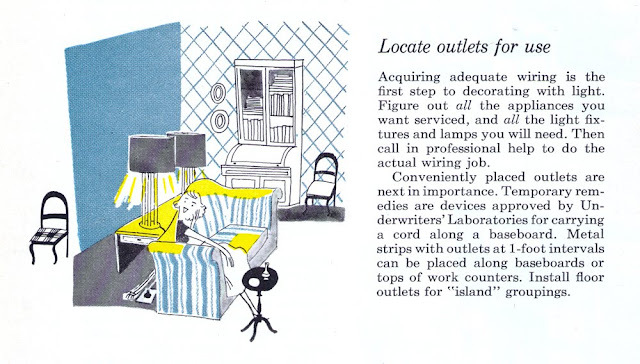 Install floor outlets for 'island' groupings."